Ready Player One has been on my TBR for the longest time! I have several friends with good taste who have read and loved it. Several months ago I snagged the e-book on sale, but it stayed unread on my Kindle. Then, spurred by the latest movie news and friends who loved the audiobook, I decided to give the audiobook a try. There were times when I was driving down the road and my heart was literally racing. (I mean, this is not uncommon when I drive in Miami -- LOL! -- but I mean my heart was racing from what was happening in the story.) 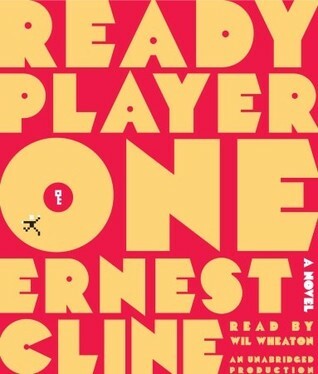 I wanted Will Wheaton, the amazing audiobook narrator, to go faster so I could stop sitting on the edge of my seat! He did such an incredible job of suspenseful reading! Every time Wade was going through a challenge I was holding my breath the whole time and freaking out to myself, worrying that he would fail. I don't want to age myself, but let's just say that I was around for some of this stuff described in the book. That was pretty cool. I enjoyed visualizing the TV shows, commercials, movies, songs, and products in the context of this story. Ready Player One was full of surprises, twists, and "OMG, no he didn't!!! "/ "OMG, no they didn't!!!" moments. I can't recommend this book highly enough. A 5 out of 5 star read for sure! This is going to a fantastic movie, and I can't wait to see it on the big screen!